So while infants were dying of thirst on my teevee all last week, Diddy was buying his 16 year old son a $350,000 car for his birthday. I should mention that his son does not have a license and cannot drive. I'm so glad Diddy found it in his heart to generously donate $10,000 to Haiti. Hope he had enough left for the rent. 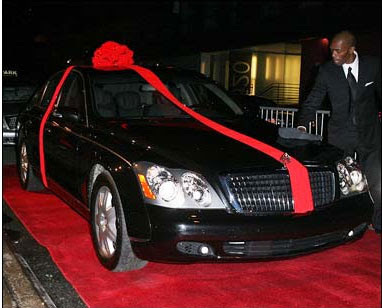 While Diddy was busy putting the red bow on the stupid car pictured here, the benefit Hope for Haiti, was immediately organized by George Clooney, and it raised $61 million dollars. I may have had something to say about Wyclef initially when Yele's finances didn't look legit (although now they hired a new accounting firm so it's all good) but at least he was handling his business. A few people are criticizing me for attacking Diddy for how he spends money he earned, and that's cool, but when you spend your money on this stupid crap while there are babies dying because they have broken bones and no water or food on my teevee, I will judge you. You clearly don't care what people think so carry on with this ignorant ish. Just know that you can't take a car with you when you leave here. Click here to donate your hard earned cash to the people of Haiti who need it desperately. BTW, big ups to The Root for the shout out on this post.